This blog post is a collaboration with Beef. It’s What’s for Dinner, on behalf of the Beef Checkoff. 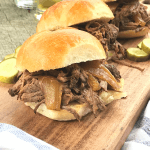 I’m excited to share one of my family’s favorite slow cooker dinner recipes. As always, all thoughts and opinions are my own. 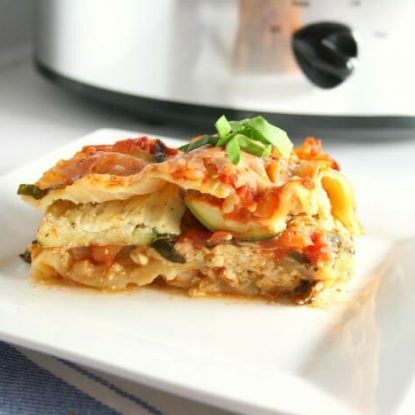 Are you a parent in need of dinner shortcuts and solutions? I am! That’s why when a friend asked what we eat for dinner on busy weeknights I decided to share. 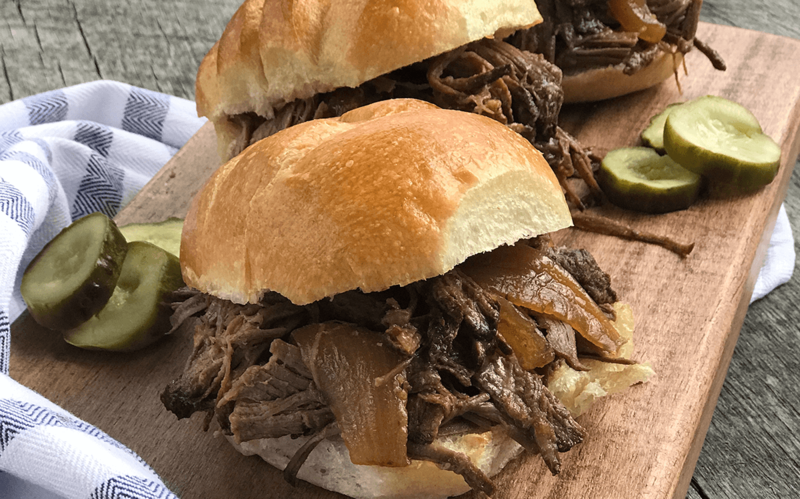 This SUPER SIMPLE slow cooker beef recipe is a regular on our meal rotation and an absolute fave. Slow cooker meals are ideal for our family because they require only a few minutes of morning prep so that by the time we get home, dinner is ready and waiting. Plus, we usually always have leftovers that I’m able to serve again during the week. 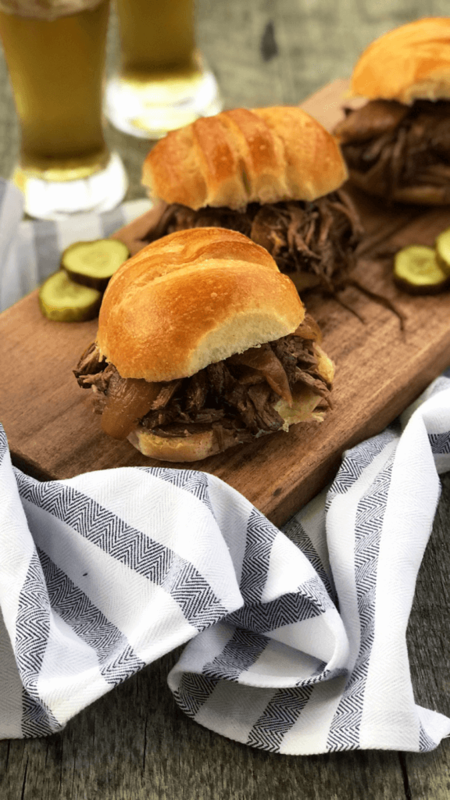 Slow Cooker BBQ Chuck Tender Roast is a game changer and a go-to for a delicious busy weeknight meal. If you aren’t familiar with a chuck tender roast, it comes from the shoulder area and yields a big beefy flavor. You may also know this particular cut of beef as a chuck eye, medallion pot roast or a mock tender roast. This larger, less tender roast is ideal for slow cooking, braising or pot roasting. Plan to make it when you have a few minutes for prep and then hours to forget about it. A 3-ounce serving of chuck tender roast has 160 calories and 28 grams of high-quality protein. It provides 10 essential nutrients including zinc, iron and B-vitamins to help support an active, heart-healthy lifestyle. After the BBQ roast cooks for 10 hours and fills your house with the most amazing aroma (or 5-6 hours on HIGH if you want to speed it up! ), you may be wondering what to do next. I like to remove the meat from the slow cooker and transfer it to a baking sheet or cutting board. Let it rest for about 5 minutes. I then do one of two things. I use two forks to shred the entire roast if we are serving a crowd. If I know I want to freeze part of the roast, I’ll cut it in half allowing one portion to cool before wrapping and freezing and then shred the other half to eat immediately. Now let’s talk about the juice… The juice left in the slow cooker has so much flavor so don’t pour it out! It can definitely be used again! If there is any fat, skim it to remove it but thankfully because a chuck tender roast is a lean cut there is usually very little to contend with. You can use the juice straight from the slow cooker or transfer it to a saucepan and reduce by half to concentrate the flavors for a simple dipping sauce. (Careful, the bowl of the slow cooker will be HOT!) I also like to spoon some over any leftover shredded meat before storing for added moisture. The meat by itself makes a wonderful meal especially when served alongside mashed potatoes, rice, polenta, or couscous. 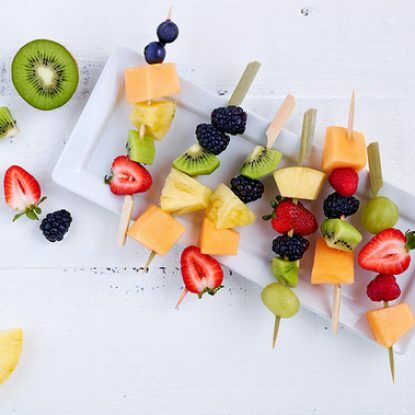 We usually will pair it with a green salad or roasted veggies like green beans, Brussels sprouts, carrots or broccoli (or a mix of all of these) to round out the meal. Most chuck tender roasts average 3 pounds which means you should have LEFTOVERS unless you’re feeding a larger crowd. Store any cooked, uneaten meat in an airtight container in the refrigerator for up to 3 days or in the freezer for up to a month. 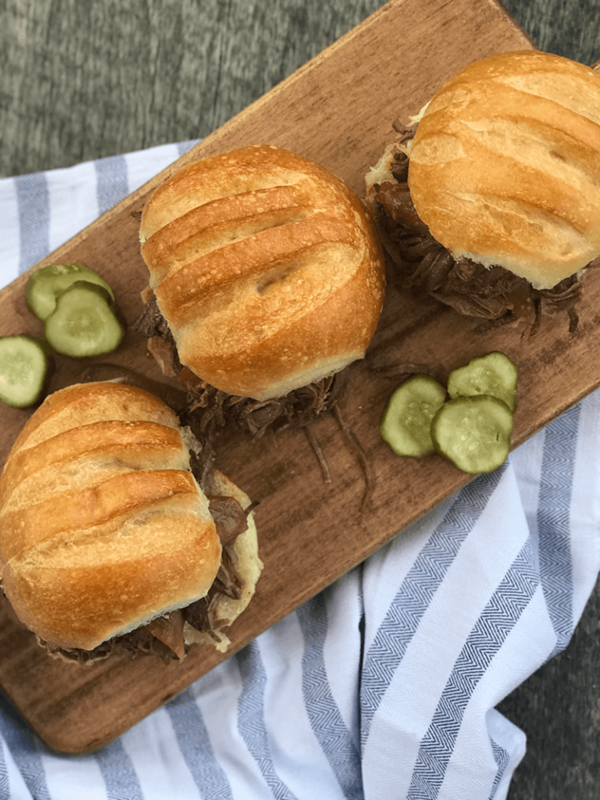 In addition to eating the roast as is, we also love using it for sliders. 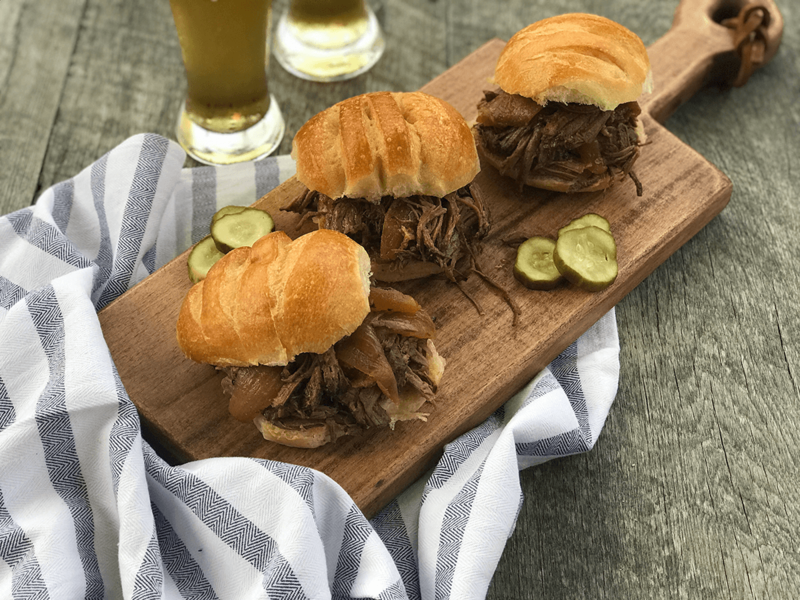 The sliders are a cinch to make since you’ll just need to rewarm any meat, onions or juice before assembling. 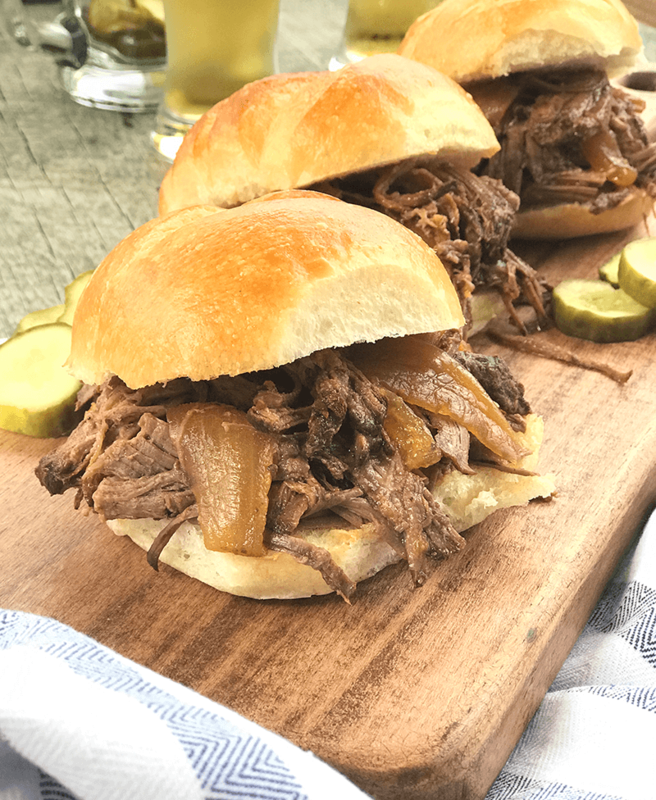 Simply pile bakery slider buns high with 2-3 ounces of meat depending on the size of your bun, onions, pickles and if you have any, some of the juice from the slow cooker. Slaw is also a nice topping or can be served as a side. I hope you’ll try this affordable weeknight meal next time you need a recipe ready when you come home for work or school. Because it uses just a few ingredients and is so easy to prepare, it is sure to become a staple in your home. Trim chuck tender roast of visible fat. Sprinkle evenly with salt, pepper and garlic powder; gently rub into meat. For optional browning, heat 1 tablespoon oil in large nonstick skillet over medium heat until hot. Brown on all sides, approximately 2 minutes per side. Add roast to 3 1/2 to 5 quart slow cooker. Cover beef with barbecue sauce. Add onion. Cover and cook on LOW 9 to 10 hours or on HIGH 5 to 6 hours or until roast is fork-tender. Remove roast and onions from slow cooker. Shred beef with 2 forks. If desired, skim fat from cooking liquid, transfer to a saucepan and reduce by half. Serve alongside beef. This looks so easy, what a great recipe! These sandwiches look SO good! Believe it or not, I don’t think I’ve ever made a Chuck Roast before. My hubby and son would love it! Thanks! I really like the chuck tender roast cut since it is leaner than a traditional chuck roast. 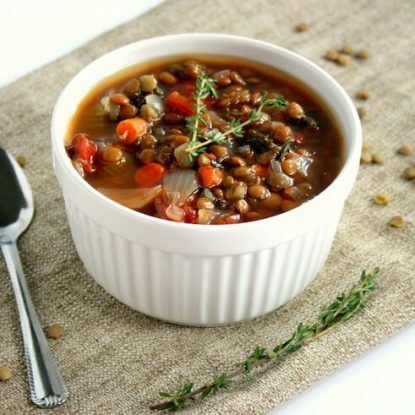 I’m always looking for more slow cooker recipes, and this looks like a perfect family meal! This is such a great use of chuck and looks like the perfect build… including the pickles! Thanks, Catherine! I’ve found that I like the chuck tender roast better than the chuck roast because it is so much leaner and gets just as tender! And the pickles for when I use leftovers as a sandwich–a must!